Five days at your business premises. An overhead crane, featuring runways, bridge, and hoist in a traditional Industrial environment. 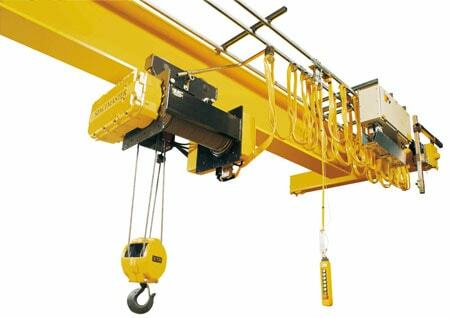 An overhead crane, commonly called a bridge crane, is a type of crane found in Industrial environments. An overhead crane consists of parallel runways with a travelling bridge spanning the gap. A hoist, the lifting component of a crane, travels along the bridge. overhead cranes are typically used for either manufacturing or maintenance applications, where efficiency or downtimes are critical factors. Capacities of equipment and attachments. Purpose, use and limitation of controls. How to make daily checks. The energizing sequences, including pneumatic, hydraulic, and electrical sequences. All basic signalling procedures, including hand, radio, or telephone signals, where required. Overhead and Gantry Cranes, and other applicable standards. Practice in operating the assigned equipment through the mechanical functions necessary to perform the required task. Maximum rated capacity of the crane. Maximum capacity of the crane.